The YOUNGFACE technique is a plastic, therapeutic and rejuvenating facial massage based on the natural ability of the skin to regenerate. It restores youth and health to your facial skin and help remove wrinkles. What makes this technique so effective? The skin is an organ, like any other organ in the body of man. It performs a protective, respiratory, metabolic and secretory function, and is also responsible for the immune system. The skin is the first part of the body to be exposed to the environment, taking the full impact of such exposure. Dust in the city, exhaust fumes, day-to-day stresses and crises disturb the correct functioning of the skin. As a result of the accumulation of waste products, our skin starts growing old prematurely. One should not forget natural ageing either. Unfortunately, this process cannot be eliminated entirely. Nevertheless, this facial lifting massage technique enables the neutralisation of the premature ageing process, remove wrinkles and it delays the natural ageing mechanism. In Russia, the YOUNGFACE technique is known by the name of ‘tonic relaxation’. This involves a radical lifting massaging technique based on the specific percussive movements of the masseur. This unique method stimulates the processes of deep cleaning within the skin, eliminating waste products and impurities. The skin starts functioning correctly and effectively, as it did when you were 20 years old, thanks to the body’s natural reserves being activated. Only 4 treatment sessions are necessary in order to activate the self-regeneration process within your skin! First and foremost, the massage stimulates venous drainage and activates the lymphatic system: deep skin layers become free from accumulated toxins and waste products. Like physical exercise, the YOUNGFACE technique strengthens all facial muscles, smooths out nasolabial furrows, visibly raises the contour line and removes wrinkles around the eyes. It brings about a long-term lifting effect without injections or surgical intervention. At the same time, dead skin cells exfoliate, and as a result of this peeling the skins transforms, becoming smooth and even. YOUNGFACE accelerates all regenerating and metabolic processes within the skin, including cell metabolism. Thanks to the improved blood supply, the oxygen and nutrient supply system is stimulated and the skin starts breathing. Facial colour becomes 1-2 tones lighter. This facial rejuvenation massage technique, working on nerve endings for an hour, allows accumulated muscular tension to be released and the mimic wrinkles to diminish, bringing about a profound relaxing effect. This technique restores a feeling of spiritual and physical balance, restoring the energy balance of the body as a whole. 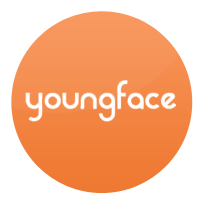 1 YOUNGFACE session lasts for 1 hour and 20 minutes. The full massage course consists of 4 consecutive treatment sessions (on a daily basis). They are recommended once or twice a year.